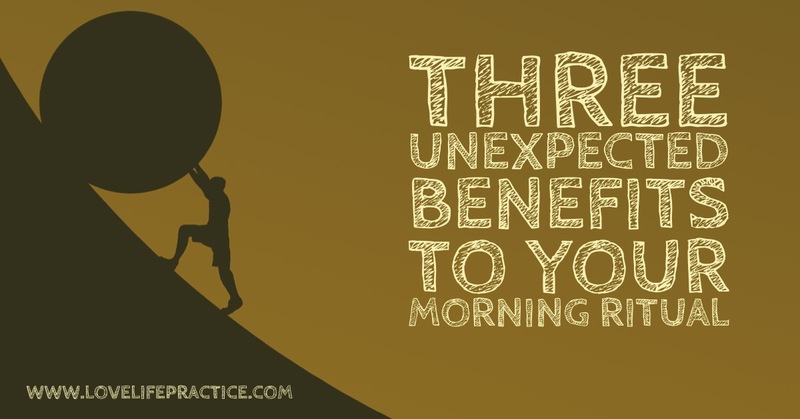 Three Unexpected Benefits of Doing Your Morning Ritual (especially when you don’t want to). – Love. Life. Practice. Three Unexpected Benefits of Doing Your Morning Ritual (especially when you don’t want to). Things have been kind of rough chez Gray. It’s not unexpected. I made a deliberate career pivot a few months ago, deciding to forego the traveling facilitator gig to try and find more stable and localized work. I had a set amount of money and time to build the skills, and I spent serious thought and effort to do so. I knew, however, that even with all the privilege of my demographic, it might be tricky. And it has been, and right now we’re in the stage where I have some new skills, but parlaying them into an actual stable income is…even more challenging than expected, shall we say. For someone like me, whose self-image is extremely tied into both my perceived utility to the world and my fiscal situation, it’s not a good place to be. Thankfully, the number of times that I actually curl up on the couch and escape into the Gravy Hose is somewhat less than the number of times I want to. Here’s the thing about understanding a lot about Scarcity Mentality, the neurochemistry of stress and anxiety, and the cycles of rough/good times: that understanding doesn’t actually make it easier when you’re in those times. It kind of makes it worse, because it adds a layer of “I really should be doing better at this to the whole situation. I’m a writer, among other things, and I do choose my words carefully, so you’ll notice that up there I said “I try to”. That’s acknowledging the reality that some mornings I’d rather do “no-ga” and just stay in bed (or, as my partner Natasha has called it, “snuggle-asana”). But right now, in the midst of a lot of self-doubt, imposter syndrome, and the joint Fears of Becoming Irrelevant and Wasting Time, the morning rituals are like a scaffold, a foundation to hold onto until things stabilize. These are things I can do become these are things I have done. And while it’s easy to talk about the various benefits of yoga, meditation, journaling, and reading, I’d like to point out some of the unexpected benefits to each. Because sometimes I don’t care about the primary benefits. But the fringe ones keep me going. Yeah. This is not that time of year. No, right now, the benefit of yoga is: I don’t have to figure it out. Kassandra or Adriene or Tim will tell me what pose I have to do next, and when to change. They don’t even mind when I swear at them as my morning-body complains about the transitions and holds. First thing in the morning, I’m not asked to do anything more than get on the mat – I have the luxury of letting someone else tell me what’s supposed to happen next. Meditation: This is even better! When I sit down and set the timer, for the next five-to-fifteen minutes I don’t even have anyone telling me what to do, and I certainly don’t have to decide what the next step is. That’s the cause of stress, you understand, whether you’re self-employed, freelancing, or doing a career transition: nobody really knows what your next step should be, certainly not you. And even when you figure out the next step, what if it’s the wrong one? But in soto zen style meditation, you have one job: just sit there. Breathe. That’s it. So for that five-to-fifteen minutes, I know exactly what the next step for me is. I am doing exactly what I am supposed to do (one of the few places just about every personal development researcher agrees is that meditation is a key component to success. Now if I could just find the door…). Journaling: I’m considering screen-printing a bunch of notebooks as journals with the label “Since I can’t afford therapy… It’s definitely not a replacement for professional help, but journaling every day gives a space for the voices in your head to safely express themselves. I can complain, I can be vulnerable, I can work stuff out. My journal is a place where my fears and worries can come out in a non-destructive way. But when I’m in the morning of another day of trying to figure it all out, the journal moves me from “being told what to do – not having to do much – I did something.” I filled a page with words. The words themselves don’t matter much; they are filled. The sucky part of “inching towards daylight” is that there are a lot of inches, and the one you’re in pretty much always looks like the one behind you and the one in front of you. Part of the situation I’m in right now is that it’s really, really hard to feel like there’s any progress being made. There is no feeling that any of the things I’m doing will make any difference is not there at all. So I have to trust the science. I can’t rely on my feelings, because my feelings lie. My meditation this morning changed the neurochemistry of my brain; my yoga changed the cellular structure of my body. None of the “primary benefits” of these rituals are instantly gratifying, and when your demotivated it’s hard to take the long view. There are some immediate benefits, though. The Morning Rituals are an escape, for a brief time, from the demands of Figuring Everything Out that fill the rest of the day. I hope you find your own morning rhythm, especially if you feel, right now, that you don’t need it. Because you’re probably right, and that means you have the luxury of playing around with it, testing and trying out different things. And when the time comes that you do need it, it will be there for you, as mine is for me. It’s good to see this back up. I missed it the last month. Things will get better soon and the path will open. 🙂 Sending positive thoughts, Gray.